WASHINGTON (AP) — As revelations emerged that Russian-linked accounts reached many more American voters than previously thought, Tech giants Facebook, Twitter and Google on Tuesday defended their security measures and promised a Senate subcommittee they would do more to stop the misuse of their platforms by a foreign nation. Just before top lawyers from the three companies began their testimony before a Senate Judiciary subcommittee, Sen. Lindsey Graham, R-S.C., quoted President Donald Trump as saying that he had won based on Twitter. Graham also said the social media platforms were being used by people who "wish us harm and wish to undercut our way of life." 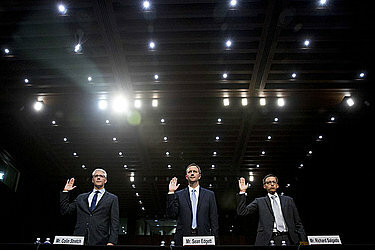 Graham said the purpose of the hearing was for the government to "figure out how we can help" the tech companies. All three will also testify Wednesday before the House and Senate intelligence committees as part of congressional probes of Russian election interference. Facebook data obtained by The Associated Press revealed that posts generated by a Russian internet agency potentially reached as many as 126 million users. The company said pages created by Russia's Internet Research Agency generated 80,000 posts on 120 pages between January 2015 and August 2017. Possible views reached the millions after people liked the posts and shared them. Testimony from Colin Stretch, Facebook's general counsel, made clear that many of those users may never have seen the material. The company said the total number represents around 1 out of 23,000 pieces of content on the site. These "organic" posts that appeared in Facebook users' news feeds are distinct from more than 3,000 advertisements linked to the agency that Facebook has already turned over to congressional committees. The ads — many of which focused on divisive social issues — pointed people to the agency's pages, where they could then like or share its material. Twitter told the same subcommittee that it has uncovered and shut down 2,752 accounts linked to Russia's Internet Research Agency, which is known for promoting pro-Russian government positions. That number is nearly 14 times larger than the number of accounts Twitter handed over to congressional committees three weeks ago. And Google announced in a blog post that it found evidence of "limited" misuse of its services by the Russian group, as well as some YouTube channels that were likely backed by Russian agents. Lawmakers have pressured the social media companies to come forward and have criticized them for not being fully forthcoming immediately after the election. All three firms are expected to face questions about what evidence of Russian interference they found on their services, as well as why they didn't find it earlier. Lawmakers are also expected to probe whether the firms know of any connections between the Russian posts and the Trump campaign. Graham, who chairs the subcommittee holding the hearing, said in a statement that manipulation of social media by terrorist organizations and foreign governments is "one of the greatest challenges to American democracy" and he wants to make sure the companies are doing everything possible to combat it. "Clearly, to date, their efforts have been unsuccessful," Graham said. The companies will almost certainly do what they can to convince lawmakers that they can fix the problem on their own, without the need for regulation. A bill unveiled earlier in October would require social media companies to keep public files of election ads and require companies to "make reasonable efforts" to make sure that foreign individuals or entities are not purchasing political advertisements in order to influence Americans. The companies haven't commented on the proposed legislation, but say they're at work on the problem. Last week Facebook said it will verify political ad buyers in federal elections and build transparency tools to link ads to the Facebook pages of their sponsors. Twitter has also said it will require election-related ads for candidates to disclose who is paying for them and how they are targeted.